Imagine being in a world where you are totally isolated from the external society, a place where you can’t talk, share feelings or understand anything. In such a hectic condition, if something needs to be gripped is one’s literary and language skills. Certainly, it’s an unparalleled gospel – but why not to give it a go and let all your hidden expertise and dexterity take over the problems of “Miscommunication”. 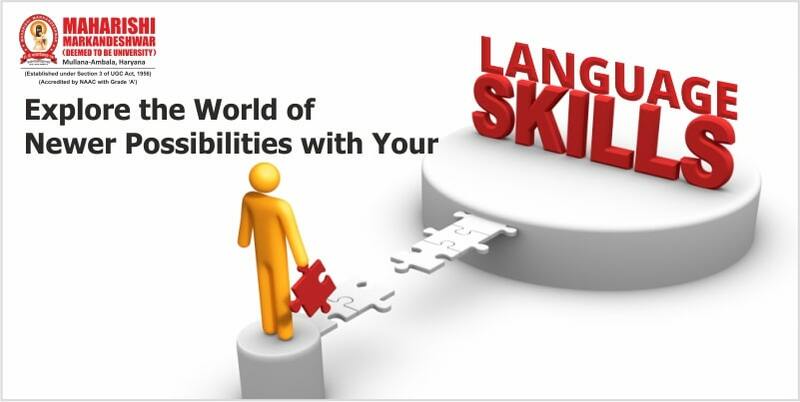 Join the legacy of articulate and eloquent people today and reveal the real “You” inside you by learning language skills. Our crucial concern is building one’s self-confidence, vocabulary, speaking skills, and top of all an unmatched personality. So get things rolling with “Literary Club” today and give a head start to all your dreams. Literary Club-EXPRESSIONS of MM (Deemed to be University) got established with a motto to improve literary and speaking talents of the students. To this effect, the club organizes a no. of debate, declamation, essay writing, group discussions, extempore competitions, quiz contests etc. in innovative ways. To incredibly encourage thinking of the students is the real objective of the club. In last semester, three of the students of the club brought laurels by bagging first positions in state-level debate, declamation, and memoir writing competitions held at different colleges. This year the club has come up with Speakers’ Association. The sessions are conducted on Saturdays with the purpose to enhance the speaking/language skills of the students. The club is also bringing out the University Magazine MMaverick. This magazine speaks about the stature of the university, including academics, cultural, sports, social welfare, etc. It also provides a platform to the students to showcase their literary and artistic skills. The best part of the magazine is that right from proofreading & editing to designing and deploying, everything is done by the students. Learn the language skills, which can become a hindrance to professional success and career at any point of time, by Joining Literary Club-EXPRESSIONS @MMDU, Mullana.